Update - June 13, 2013: Joshua Stafford was convicted of conspiring to use a weapon of mass destruction on June 13. He faces up to life-in-prison. The other four suspects have all pleaded guilty and were sentenced to between six and ten years in prison. The five men, Douglas Wright, Brandon Baxter, Anthony Hayne, Connor Stevens, and Joshua Stafford, had been considering acts of violence for months, according to federal agents. Two of the men placed what they believed to be explosive devices at the bridge and tried to remotely detonate it. The devices, however, were inert and provided by the FBI as part of a sting operation. Wright, Baxter, and Hayne have been charged with conspiracy and attempted use of explosives; charges against Stevens and Stafford are pending. 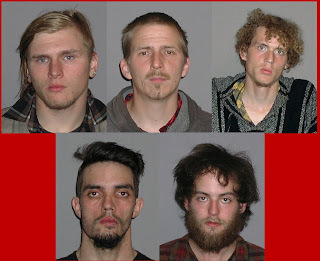 All five men were apparently involved in Occupy Cleveland protests and have been characterized by law enforcement or self-identify as anarchists. Hayne, Stafford, and Baxter list the movement as their “employer” on their Facebook pages. In recorded conversation with the FBI, Baxter discussed the impact of blowing up a bridge. “Taking out a bridge in the business district would cost the…corporate big wigs a lot of money,” he said. Wright believed that the Occupy Movement had been coopted by “corporate American and law enforcement” and that therefore they needed new recruits from outside the movement. The media coordinator for Occupy Cleveland denied any knowledge of the planned attack, but acknowledged that some members of the movement are acquainted with the suspects. The five men allegedly considered other targets for attack, including the local Federal Reserve Bank and law enforcement Fusion Center, before settling on the bridge. Baxter inquired into targeting the Klan or other neo-Nazi groups in Ohio, but was dissuaded when he was told they were not in Cleveland. He claimed to have previously participated in a protest against the Klan in Oakland, California. The planned attack was allegedly timed to coincide with May Day, a celebration of International Workers Day that has been seized upon by anarchist and anti-capitalist groups around the world. May Day events around the world have often featured property destruction and arrests.